Sussex eventer Tina Cook is looking to qualify for the Olympics at the FEI event in Ireland later this month. Cook needs to qualify as a combination with her horse Miners Frolic, after he suffered from colitis last year. The Findon-based rider told BBC Sussex: "It was only 50-50 and he very nearly died. He was very lucky, he pulled through and he looks fantastic now. "I've now got to get him fit and qualified for the Olympics, which is crazy. That's the main objective." 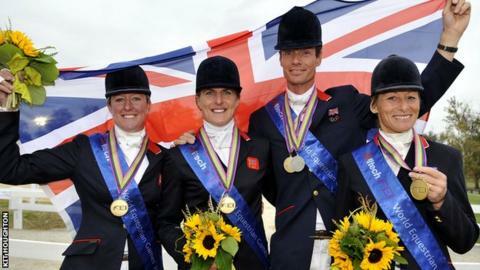 But Cook, who won two bronze medals riding Miners Frolic at the Beijing Olympics in 2008, will not be guaranteed a place in the Great Britain team even if she reaches the standard for selection. She is wary that there are plenty of rivals for the five spaces in the team. "The qualification isn't that difficult but you've got to complete the competition and put in a good performance," she added. "The fact the horse missed most of last year [means] there are obviously other people, Zara Phillips being one of them, that got some good form toward the end of the year. "There's a lot of us battling out for the five places that are up for grabs. There are quite a few other riders with lots of experience." The FEI competition in Ballindenisk begins on Friday, 24 February.